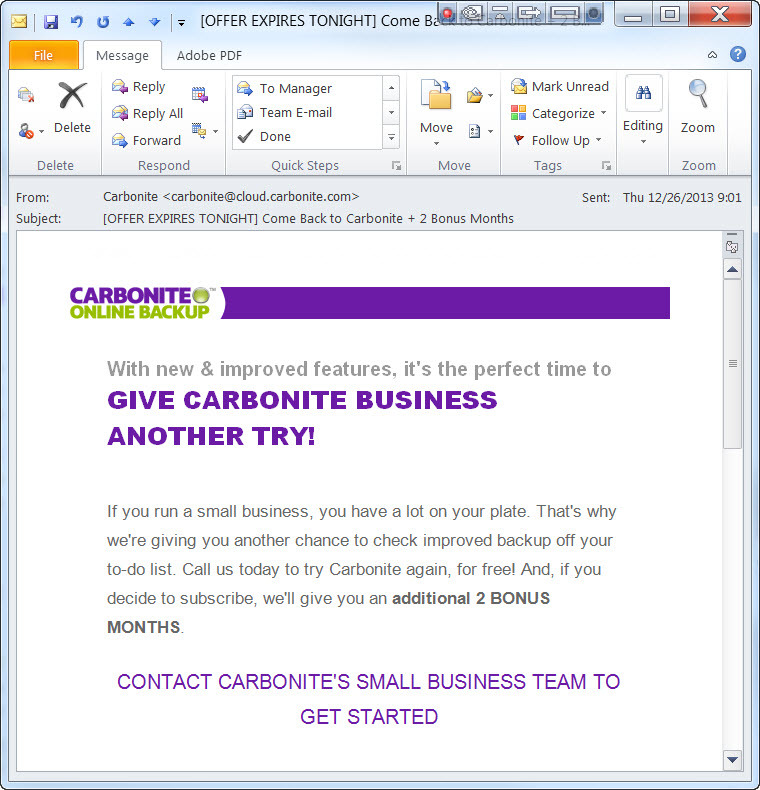 I originally purchased the Carbonite Business service based on the strong recommendation of Leo LaPorte and the product’s ability to let me manage my own encryption keys. Although this feature is advertised heavily on Leo’s various shows, it is not one that Carbonite recommends to its users. In fact, although the install screen does not make it obvious at which point to save the user-managed key, it does walk the user through several dire warnings about using that particular feature. The installer GUI makes it very clear that if I manage my own key and lose it, Carbonite has no way to help me recover the key and I lose all my data. But in a regulatory compliance environment, that’s not a bug. It’s a feature. It’s why I bought the service. Shortly after installation I received an email with further warnings about managing my own key and how to protect it. Unfortunately since the setup dialog didn’t make it clear at which point it had generated a key or require me to save that key before continuing, I never had it to begin with. I had assumed that, like many other encryption programs, Carbonite would let me recover my own key locally from within the installed version of the program and save it post-installation. Again, unfortunately this is not the case. No wonder you have tons of warnings. The self-managed keys feature is practically designed to fail. In other words, the Carbonite Business install procedure has many checkpoints that protect Carbonite’s interest with regard to user-managed keys, but almost none that protect the user. When I called and emailed for help I finally did get to speak with someone, but only after several calls abandoned after 10 minute waits or more. The customer service rep I finally spoke with then proceeded for several minutes to tell me why managing my own keys is a bad idea, despite my explanation that this feature is the only reason I considered the service in the first place. When I finally got Carbonite Business working, I ran into a situation at a client’s office in which Carbonite Business rendered my machine completely unusable. Because of how Carbonite Business interacts with proxy servers and my client’s port filtering, the Carbonite Business service process running in the background grabbed focus every 2~seconds. This made it impossible to type into a browser, emails, editors, or anything else. Typing is how I make my living. This is a serious issue. It took hours to diagnose the problem and the lost billing was about 4 times the yearly cost of the Carbonite Business service. When I figured out what was happening and tried to call Carbonite Support, I was unable to get anyone on the line and was forced to uninstall the program in order to get any billable work done. Apparently the name “Carbonite Business” has less to do with the level of live customer support than it does with the amount of storage the user gets. It certainly should not be taken by customers to mean that if their business is in jeopardy because of the product that Carbonite will provide expedited service to fix it. How disappointing. So, despite all the warnings about the dangers of managing my own keys, it turned out to be the unavailability of Carbonite’s customer service that placed my business at risk, caused me considerable lost billing and impacted my customer as well. I now have a Space Monkey device with 1TB of encrypted cloud storage, as well as a TrueCrypt volume backed up to commercial cloud storage. I will never use Carbonite again and regularly advise colleagues, customers, family and friends to avoid Carbonite as well. Please take me off of your customer list and out of your lead generation system. This is not the first time I have requested to be removed from your customer list and marketing so I assume that you may have lost the previous requests. I feel compelled to warn you that managing your own email can be risky. If you manage your own email and lose customer communications then we customers have no way to help you recover them. PLEASE PRINT THIS EMAIL BEFORE CONTINUING. Remember, I cannot be responsible if you lose or fail to act on customer communications and cannot help you recover lost business. This entry was posted in Clue train, Rant, Tech and tagged fail, infosec, rant, security, technology, work. Bookmark the permalink. T.Rob, brilliant turn of the tables on Carbonite. And many thanks for the warning – this is one more customer Carbonite will never have.